Download Sample Report This report is offered as a tool for helping investors understand key factors in retirement investing. The charts and graphs produced from the information provided by you in the form below will be based on a Monte Carlo simulation method. This method simulates 10,000 portfolio outcomes an investor may experience based on long-term historical data starting from one of 100 IFA Index Portfolios, with a Glide Path option. 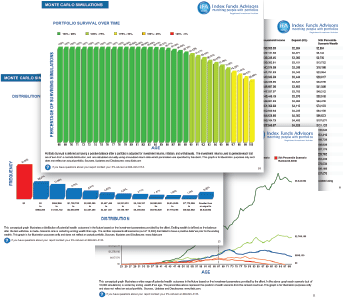 The scenarios are presented in terms of statistical probabilities of portfolio survival at various ages of your retirement. The inputs include your age and time horizon, initial wealth, periods of savings and withdrawals, investment risk level based on your Risk Capacity Survey results or your age, an option for a Glide Path and a choice of whether to include or exclude the Great Depression in the historical risk and return assumptions of annualized return and standard deviation. This report is based on many assumptions which can make large changes in the outcomes and in no way can cover all the changes that occur throughout a lifetime. Your PDF report download link will be provided immediately and at no obligation. Your age must be a whole number from 0 to 120. Are you currently retired? Yes No Please select if you are retired or not. What is your current annual household gross income? Income must be a number from 0 to 1,000,000,000. Estimate the average increase in your annual salary during the years of your employment? A common annual increase would be between 3% and 6%. Percentage must be a number from 0 to 100. Estimate the percent of your current annual household gross income you plan to contribute to retirement in years of employment. A typical annual contribution percentage would be between 5% and 15%. Most employees expect to retire at 67 years old. What age do you plan to retire? A number between current age and 120. The standard method of determining safe withdrawal rates during retirement is to take a percentage of your initial retirement portfolio, then adjust that dollar amount for inflation throughout your retirement. IFA also assumes that you will pay your taxes from those withdrawals, and that social security and other sources of income will be in addition to these withdrawals. As of 2016, the maximum social security benefit is $33,453.60/year for someone who retires at the current full retirement age of 66. We suggest 4.5% of your portfolio at retirement. Would you like to see what dollar withdrawals that would provide you? No, I want % of my portfolio at retirement. No, I would like to specify my dollar withdrawal rate at retirement. The calculation below will help you estimate your first year annual withdrawal from your retirement savings in today's dollars. IFA will adjust this dollar amount for inflation at the time of your retirement and then adjust the withdrawals for inflation during your years in retirement. IFA also assumes that you will pay your taxes from those withdrawals, and that social security and other sources of income will be in addition to these withdrawals. As of 2016, the maximum social security benefit is $33,453.60/year for someone who retires at the current full retirement age of 66. The maximum benefit for your planned retirement age is calculated by default. To determine your estimated Social Security benefit at varying retirement ages, please visit www.ssa.gov/mystatement. Based on your current income of , IFA suggests a replacement rate of . $ = Estimated Annual Withdrawal from Savings Must be a number from 0 to 10,000,000,000. Most retirees plan to withdraw from their savings for 25 to 30 years from the date of their retirement. How many years do you plan to withdraw from your savings? Years to withdraw from retirement savings must be a number from 1 to 120. What is the current value of your retirement savings? Current value of your retirement savings must be a number from 0 to 100,000,000,000. If you took the Risk Capacity Survey at ifa.com, what Index Portfolio did it recommend at the end of the survey? If you did not take the Risk Capacity Survey, enter 0. IFA needs to estimate the expected return and risk (standard deviation) of your Index Portfolio. Would you like IFA to use the 91 year data, which includes the Great Depression? If you choose no, IFA will make its estimates of risk and return based on the last 50 years, which does not include the Great Depression. Yes No Please select if you'd like to use data going back to 1928. It is not realistic to assume investors will keep their investments at the same risk level throughout their investing lifetime. Therefore, IFA advises its clients to put their Index Portfolios on a Glide Path, which reduces the Index Portfolio by one number per year, which is a 1% reduction in the equity allocation per year. Would you like IFA to assume you are on the Glide Path? Yes No Please select if you'd like to use Glide Path. What kind of investor are you? Please select what investor type you are. You invest in actively managed mutual funds without a passive advisor. You invest in index funds without a passive advisor. You invest in index funds with a passive advisor.